Learning numbers for toddlers is a wonderful way to introduce those little guys to math concepts. These counting activities will help your child get math basics down while having just plain fun. Every week you can find amazing projects, crafts and activities to do with your kids with the Kids Co-Op, and I’ll be highlighting some of them with a common theme. 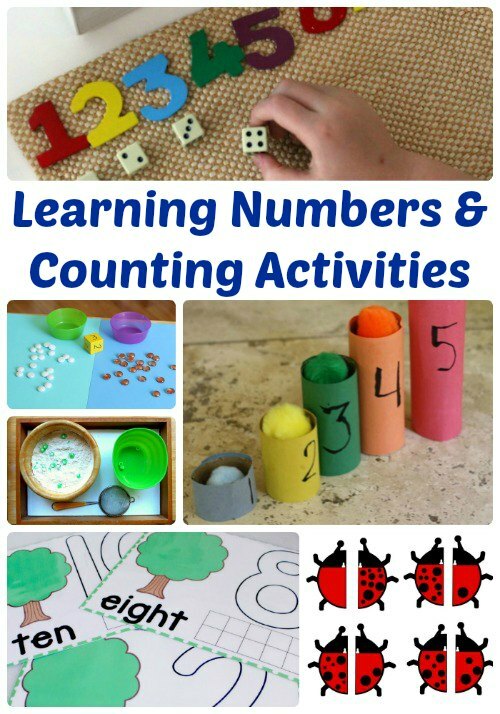 This week’s theme is learning numbers and counting activities. 17 (Almost) Effortless Preschool Math Activities | What Do We Day All Day? I love the ideas/tips. I spend a lot of time with my granddaughter who is two and learning her numbers and colors and this will help me ‘play’ with her while she is learning. So pleased to hear that it’s perfect timing 🙂 Have lots of fun! Thanks so much for hosting & for including our ladybug counting printable!